The Real Estate Regulation and Development Act (RERA) punched the clock in May 2017. The Act was introduced with the demeanor of protecting the interest of homebuyers by creating transparency in the real estate industry. In the following article, we will be focusing on the Positive Impact of RERA on homebuyers. The opacity in the real estate sector is not Greek to anybody. Homebuyers were grieved by fraudulent builders including frauds like intentional delay in possession, multiple buyers, a defective title of the land and profile funding etc. With the out start of RERA, the rights of homebuyers will be restored. RERA will be acting as a watchdog to make sure that all compliances of builders and homebuyers are met. The increased assertion on the timely completion of projects and delivery to the consumer. An increase in the quality of construction due to a defect liability period of 5 years. Formation of RWA within a specified time or 3 months after a majority of units have been sold. Enactment of RERA Authority: A functional authority includes protection of the interests of the stakeholders and yielding complaint redressal system for homebuyers wherein their complaints will be heard. Compulsory Registration: It was mandatory for builders to comply their projects with complete details under RERA, by virtue of which fraud builders could be filtered out. Continual disclosures by promoters: Promoters cannot intentionally delay the project as they have to submit periodic progress of the project. A standard model of sale agreement: As per the act, there is a standard format for the sale agreement. The builder has to follow the format and cannot add any penal clauses that may ask for a penalty from homebuyer. 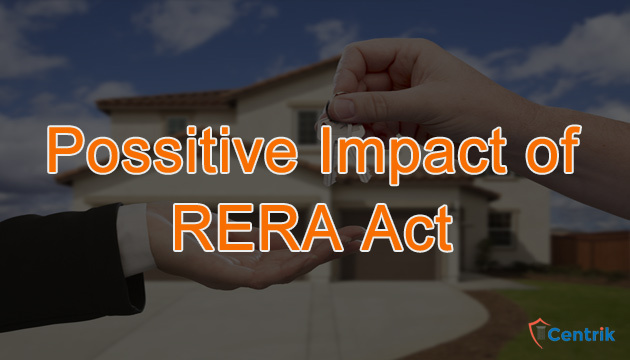 Penalty: Any violation of the RERA Act will invite penalty for the promoter (10% of the project cost). Therefore, builders will take into account before any violation.